Lena O Mahoney, St Joseph's, Ardfinnan. 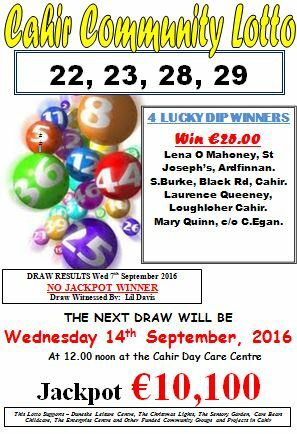 THE NEXT DRAW WILL BE Wednesday 14th September, 2016 At 12.00 noon at the Cahir Day Care Centre. Jackpot €10,100.